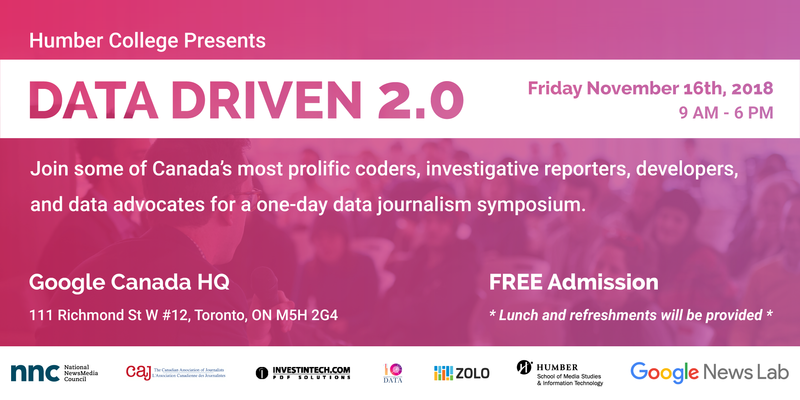 Join some of Canada’s most prolific investigative reporters, developers, coders and data advocates for a one-day data journalism symposium. Delve into the strategies they use to turn terabytes of raw data into exclusive scoops that have already had a demonstrable impact on the politics, social justice, and day-to-day lives of Canadians. We couldn’t have made Data Driven happen without the generous support of our sponsors: Google Canada, Google News Initiative, Canadian Association of Journalists, Zolo Realty, University of King’s College, Investintech, the National NewsMedia Council, and of course, Humber College’s School of Media Studies.